Jordan Dickie brings the energy. Count on her to enter any room with a smile, and to always find a way to strike up a conversation with someone new. As a client, you can expect that energy consistently from Jordan – whether she’s listing your home to sell or finding you that perfect new place to call home. 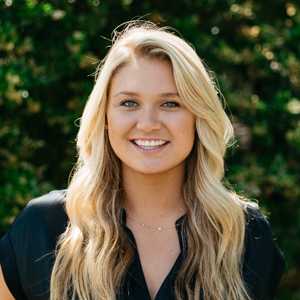 Jordan has learned the nuances of the real estate business in growing markets across the South, including Alabama, Houston and Dallas, where she worked with some of the country’s top-tier luxury agents. In Dallas, she has focused on becoming a neighborhood expert so she can work with clients at every price point, from young professionals seeking a starter condo in Uptown to families looking for elegant homes in Highland Park and Preston Hollow. She has been involved in about $500 million in sales to date. When she isn’t negotiating a deal for a client, you can find Jordan on the Katy Trail or strolling the streets of her neighborhood, Knox District. She loves this East Dallas neighborhood for its walkability: She can park her car after work and walk to the grocery store, to meet friends for dinner or to shop. She is active with the Friends of the Katy Trail and serves on the board of her townhome community – always working to stay in touch with what’s going on so she can help her clients.